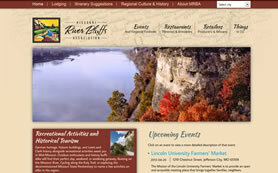 Missouri River Bluffs Association Has A New Home. Need a vacation close to home? Missouri River Bluffs Association is a collection of people from all backgrounds. Everyone from producers and growers to restaurateurs and hospitality providers. This collection of professionals came together to compile a network of resources for Mid-Missouri vacationers. If you are going somewhere in Mid-Missouri, specifically Boone, Callaway, Moniteau, Cole, and Osage Counties, this site is a must-see. They have every bit of information you could possibly want about the area. What good is a ton of information if the user interface stinks? The answer is none… None at all. So we made a site that is easy to use and looks good; we don’t really do things any other way around here. This site uses a place and event compiling system that is separated into categories that the site uses for organization. This way no matter what you are looking for, a place to stay, food, or something to do, you can find it. Check it out for yourself, find a new place to eat at in the city of your choice. Lookin’ good isn’t a choice, it’s a requirement. Missouri is a beautiful state and MRBA has the pictures to prove it, so we gave them a nice big slideshow on the home page to display that beauty. The site has a red, off white and blue theme to it and all the colors are scaled back and muted to give a calming feel to the whole site, the kind of feeling you would want on a vacation. Does your site look good or great? Is your site not quite as beautiful as Missouri, or do you just need a site in general? Contact the team at MayeCreate Design. We believe websites work when good design meets solid functionality. Our web designs always aim for ease of use and clear communication. Check out our portfolio for a look at our other projects and get your pride on, today.